NBC’s “New Year’s Eve with Carson Daly” will ring in 2013 from Times Square in New York City. The show will feature live performances from Grammy Award-winning group Train and Cassadee Pope, winner of NBC’s “The Voice,” as well as some of the best musical performances from 2012, including Madonna’s halftime show at the Super Bowl XLVI. The high definition, two-hour special will air live on Monday, December 31, beginning at 10/9c. 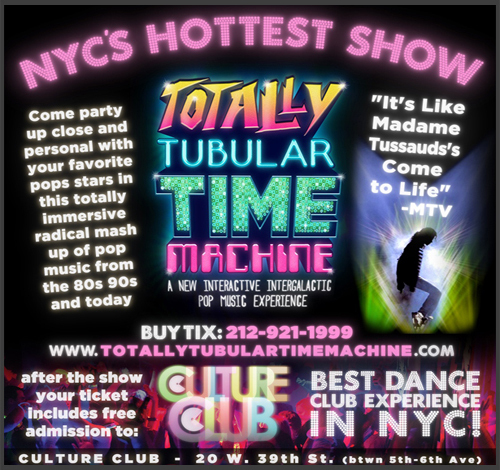 TTTM is a reality based pop musical that allows you to time travel and party up-close and personal with a cast of “celebrity” pop stars (past and present) performing your favorite hits LIVE: Madonna, Britney Spears, Michael Jackson, Lady Gaga, Justin Bieber, Vanilla Ice, and more! This party bus of time machines takes off every Saturday night. It’s a blast! RESTRICTIONS: Regularly $60. Tickets are General admission. Offer may be revoked at anytime and is subject to availability. Not valid on prior purchase. Offer cannot be combined with other discounts or promotions; blackout dates and restrictions may apply. Maximum of 8 tickets total with offer. Must be 21 and over with valid ID to be admitted to show. “Holiday” by Madonna, performed live on KCAL-TV, Los Angeles at CBS Studios by The Ukelele Orchestra of the Western Hemisphere. Kicking off “CHIPS for Kids” toy drive segment with KCAL weather caster Evelyn Taft. Madonna’s guitarist Monte Pittman has launched his Kickstarter Project for his upcoming album “M.P.3: The Power of Three, Part 2” which will be recorded in a couple of months in Copenhagen. Fans can back it and get cool incentives in return, from Madonna tour guitar picks, to advanced download of the new songs and even house parties! Monte is thankful for every fan’s support and is looking forward to bringing more awesome music to your ears! Madonna’s drummer Brian Frasier-Moore is up for “Best Drummer” in the Modern Drummer Readers Poll 2013 “Pop” category. “Girl Gone Wild”, choreographed by MDNA Tour dancer Derrell Bullock and choreographic duo Nappytabs, is up for a DanceOn Dance Video Award in the “Best Dance In A Music Video” category. Style icon and fashion chameleon Madonna has reinvented herself yet again this year for her “MDNA” world tour. The iconic singer resurrected her 1980s style and blended it with a modern charm that resulted in a look so chic it has landed her on our best dressed of 2012 list. Her Cleopatra-inspired look at the NFL Super Bowl XLVI game halftime show was especially stellar — designed by Givenchy’s Riccardo Tisci, the glittering gold and regal couture costume confirmed her Madgesty as the reigning Queen of Pop and a timeless fashion icon. An article written by Michael Phillips. It is almost certain that no matter where you are in the world, almost everyone knows of Madonna. Whether you are 16 or 60, the majority of the world’s population should be able to name at least one Madonna song. Madonna is undoubtedly the queen of pop music, having sold over 300 million records worldwide and is among the list of the highest selling artists of all time, with the likes of Michael Jackson, The Beatles and Abba joining her on that list. Madonna can also boast that she is the highest selling female artist of all time, and shows no intention of stopping.